Maybe Mandy will buy Rosalind, there is always hope! I would love to see a list of all the perfect ladies Mandy has purchased in the last 3 years, or so. Just to see that Jewel Box that she has put together. That would be a project for some online genius, not me! Any takers?!? I would if I knew where to start! That's all I could come up with so far. Mandy Pope bought Rhumb Line? From Blood Horse: "Pope spent a total of $9,050,000 all but one coming from the Hill 'n' Dale consignment. In addition to Betterbetterbetter, Pope also paid $2 million for Hill 'n' Dale's Rhumb Line, dam of such runners as Zazu and Flashback who is carrying a Tapit full sibling to both of those runners. Whisper Hill's purchases also included the Gainesway agency's $1 million Speed Succeeds, dam of Brilliant Speed and in foal to Street Cry". She really is putting together her own "jewel box". She's got a good balance of proven producers, such as Rhumb Line and Speed Succeeds and then graded stakes winners who have the potential to be top producers themselves. That's a whole lot of Girl Power! I love that Ms Pope, like the Mosses and Ms Banke, have allowed us to live vicariously through the lives of their famous race/broodmares and foals on websites and Facebook. Many thanks to them for that! Hurstland bred her. Legacy bloodlines. Bred cry and catch me g1 winner and certify winner of Cartier and got hung up because of drug use by stable for over a year. I am hoping she stays in the US! There are several super mares/fillies going to sale this fall, and I worry they will be snatched up and whisked away by over sea interests. I say this with all respect to Mandy Pope (she is one of my favorite owners right now) and in the spirit of good sportsmanship and just kidding. L.A. Style is running September 13th in a maiden special weight for 2 year old fillies going 5 1/2 furlongs at Monmouth. She will be ridden by Ramon Moya. She is trained by Timothy Hills and owned by Whisper Hill Farm. 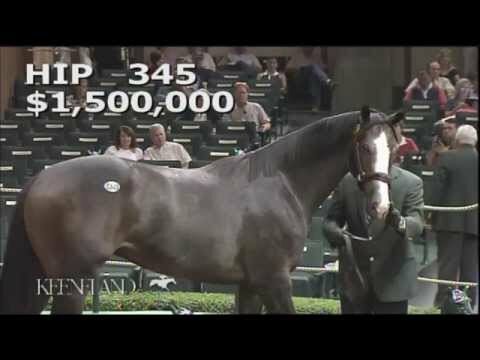 That Unbridled's Song colt that Mandy Pope won is certainly a good looking one! I'm enjoying how she is planning for the future of her breeding/racing operation with the wonderful mare she has and now this pretty boy. Sure hope he can run some!! Lol! !